Uninterested in listening to Jesse Morrell preach about the sins of gays and lesbians, I joined a small group that had managed to collect just to the right of him. The small circle was gathered around another man—one in a red sweatshirt and sunglasses who, when asked if he was “with him,” nodded. Spending time with this man was not necessarily more enjoyable, but it was easier. I could pitch questions to him that he would respectfully answer. Any student who disagreed could then debate with him; sans having to scream vulgarities to get attention. What struck me the most about the conversation we had, however, was the concept of sin—something that, apparently, this man and Jesse Morrell do not have. Salvation is, by far, the greatest gift that a Christian could receive. According to Morrell, however, salvation is conditional—it is achieved only in a state of sinless perfection. As Urban phrases it, “one has to completely stop sinning in order to be justified before God.” Sounds like Moral Government Theology to me. “So why was Jesus crucified?” someone inquired a bit too loudly. That was enough for me; I stood up from the concrete ledge I had been sitting on and began to walk away from Morrell and his—what I considered to be—blasphemous statements. However, once back at my dorm, I contemplated Morrell’s motivations. Though I did disagree with practically everything he preached, I admired him for standing up in front of the crowd, actually evangelizing. Though I found several fallacies in his argument, I understood that, for whatever reason, those were his beliefs, and he was doing his best to bring Christianity to unbelievers. 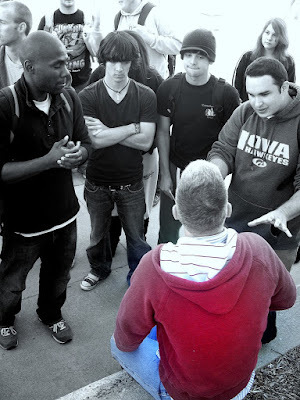 He was trying to promote the word of God and bring people closer to personal salvation. He just had an...interesting...way of doing it.